Why do we shout, “I see!” when we understand something? It’s an amazing fact that we’ve all but forgotten these days, but our brains are hard-wired to think in pictures. And when we harness the power of pictures in business, education and everyday life, we unleash a huge untapped creative power to innovate, communicate and problem solve. Visual thinking is the process of organizing and processing information by seeing it, using pictures, cartoons, diagrams, colours and maps. When information is presented visually, it takes on a new life; stories tell themselves, connections form, ideas meet and breed. It’s a powerful tool for businesses, because visual thinking makes the complex simple, communicating data and big ideas quickly. Want to understand something? Draw it. Since the earliest cave paintings, humans have told stories about the world in pictures. The ancient Egyptians used them to represent ideas. A drawing of an ox conveyed the essence of that animal efficiently. Children instinctively draw in the same way, using ideal forms – think of the shorthand of stick figures. These days we think of intelligence in terms of verbal and textual thinking, but some of the world’s great geniuses were visual thinkers – Leonardo da Vinci – an inventor and engineer as well as an artist – used visual thinking to create new ideas. Albert Einstein, best known for a textual equation, once said he didn’t think in words at all. It was perceptual psychologist Rudolf Arnheim who realised we were all missing something crucial here. He coined the phrase “visual thinking” in 1969, arguing that art was our most natural thought process, a way of understanding the world. And since Arnheim dragged visual thinking back into the spotlight, we’ve gradually been coming round to the idea that the best way to understand something might be to draw it. 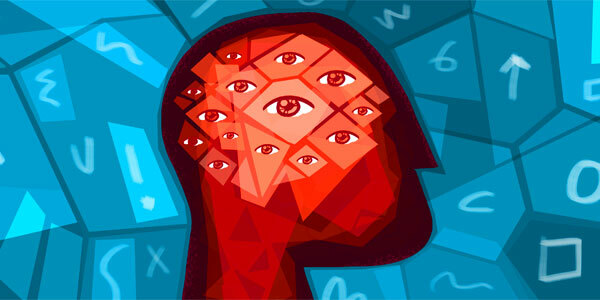 Our sight is our fastest sense; a quarter of the brain is dedicated to processing visual information. And we remember things better if we see them. If you add visuals to text or audio, you increase retention in your audience by 40%. If you doodle when listening to verbal information, you’ll remember 29% more than if you don’t. Visual thinking is an incredibly powerful communications tool. In the information-dense world of today, governments, businesses, professionals and educators need ever more effective ways to engage their audiences. Recent studies show that the secret to why some stories become massively popular online is due to the emotional response that the story elicits. And overwhelmingly, a positive emotional response results in far higher engagement and potential to be shared. Other studies show that the combination of audio, written words and pictures stimulates the brain and vastly increases memory and understanding when compared to just listening or reading alone. Visual thinking and visual communication can make audiences more engaged in what they are watching, help them better understand the messages delivered, make them feel positive and make them far more likely to share the information with others. When people employ the techniques of visual thinking in their communication, it can literally make the invisible visible. It can be used for anything from communicating a Big Idea effectively to training a team with a new policy. And visual thinking injects fun and wit into the working environment. If your communications are stifled by dry statistics and jargon, introducing a visual element can galvanize a room, or spread across a workplace community, unleashing creativity and insight you never knew was possible. Visual thinking turns us into information explorers, wandering a landscape of data and ideas. We might see landmarks we hadn’t noticed, come upon familiar sights from new angles, or stumble upon something beautiful as an unexpected view opens up before us.